Popularly known as Chinese cabbage, Napa cabbage is native to China. It has also earned a global presence in food cultures throughout all hemispheres. It is the most popular cabbage featured in supermarkets around the world. Napa cabbage is known for its signature barrel-shape and crisp, pale green, tightly-wrapped leaves with a white mid-rib and a dense heart. The outer leaves curve inward and are true green to pale green. The interior leaves and the heart is yellow to ivory colored. Its flavor is more subtle and pleasant than European head cabbage. The water content is also higher, creating a crisper and more refreshing texture. Napa Cabbage has a mild flavor, that makes it excellent ingredient for a variety of salads and vegetable dishes. High in vitamin C with smaller amounts of calcium and fiber, this cabbage is predominantly grown in Asia and the United States. It is also a variety of Cabbage that medical experts regard highly for containing compounds known as indoles that have been associated with preventing some types of cancer. Napa cabbage is the used in soups, slaws and stir-fries. It can be used in raw applications, braised, stewed and even grilled. Families in China would stock up on it during the icy winter months. Napa cabbage is still a mainstay of northern rural China’s winter home cooking. In addition to using cabbage in soups, salads, stir-fried dishes, Mongolian hot pots and dumpling fillings, Chinese traditionally preserve it in the form of kimchi and sauerkraut. 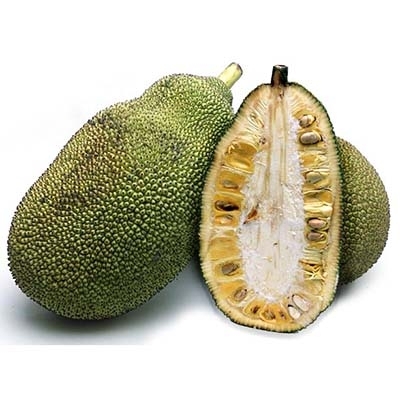 Young jackfruit is hard to find. Though I don't encourage, you can make this recipe with canned jackfruit. In a mixing bowl, combine filling the ingredients. Cover and let it rest for atleast 10 minutes. Split napa cabbage leaves. Cut cabbage hard stalk. Heat 3 cups of water in a sauce pan. Don't boil. Heat till you see steam. Place cabbage leaves in hot water for few seconds. Time will vary how young leaves are. For outer dark colored leaves, it might take more time. Remove when leave's are a bit soft. Don't over cook. If they are overcooked, leaves are soggy. Cut leaves approximately 6 inches by 3 inches. Place stuffing on the leaves, leaving 2 inches on both sides. Roll on sides first and then roll length wise till end. This way rolls are covered on al sides. These rolls have flavors and textures, to me it didn't needed any sauce. Jackfruit's meaty texture, cabbage crispiness and flavors from spices.